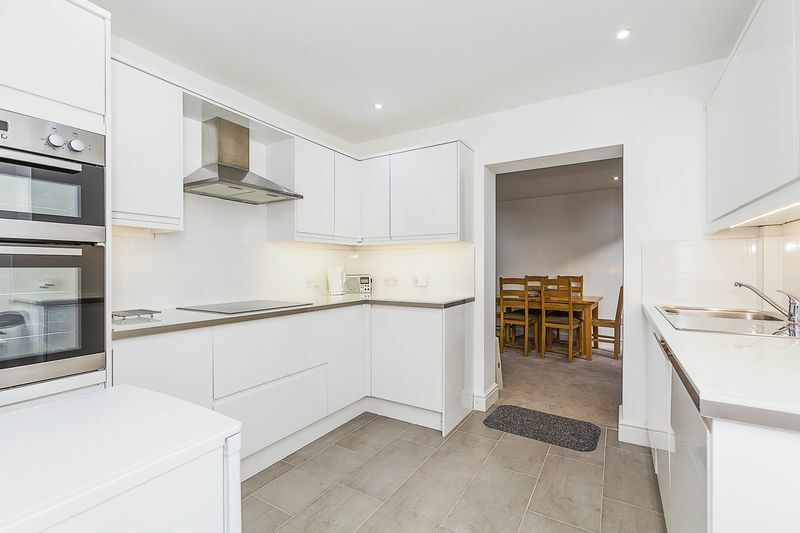 NEW INSTRUCTION, RARE TO MARKET. 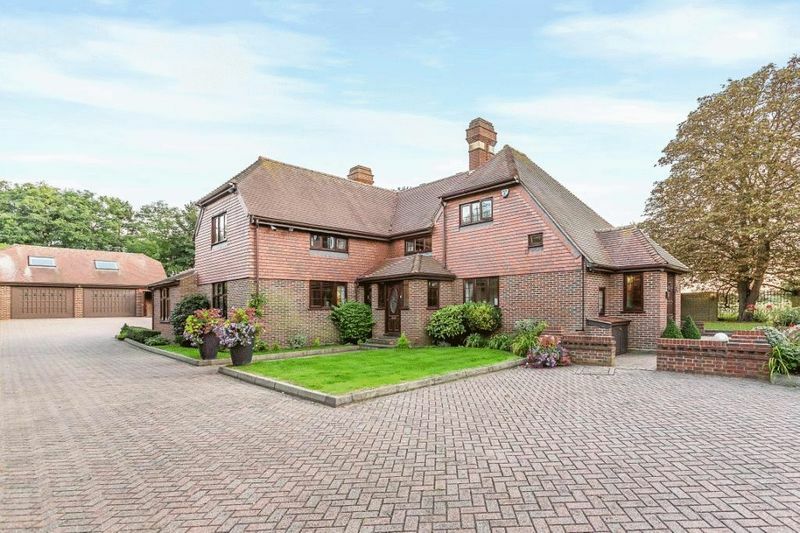 Large prestigious 4685 sq ft (435 sq m) detached 4 bedroom extended period property in approx 0.7 of an acre with large double garage with annex, large driveway, duck-pond and mature landscaped and walled garden. 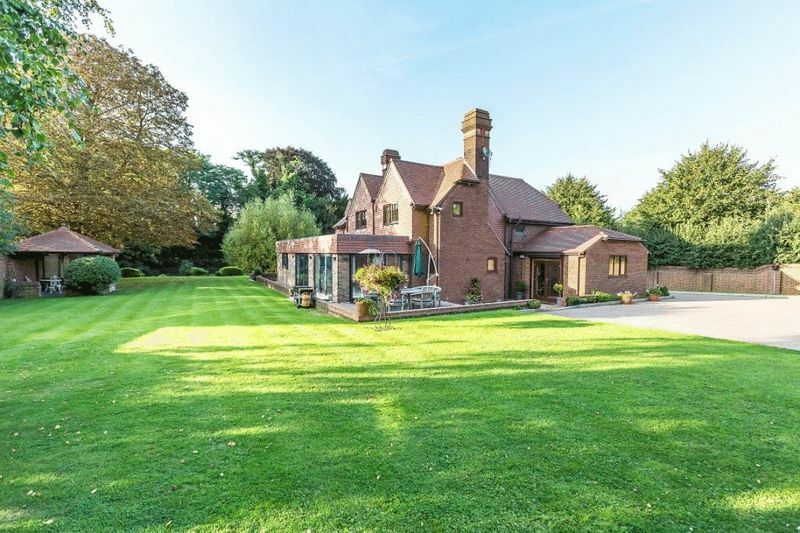 Harpers & Co are delighted to offer arguably one of the most prestigious properties to come to market for years. 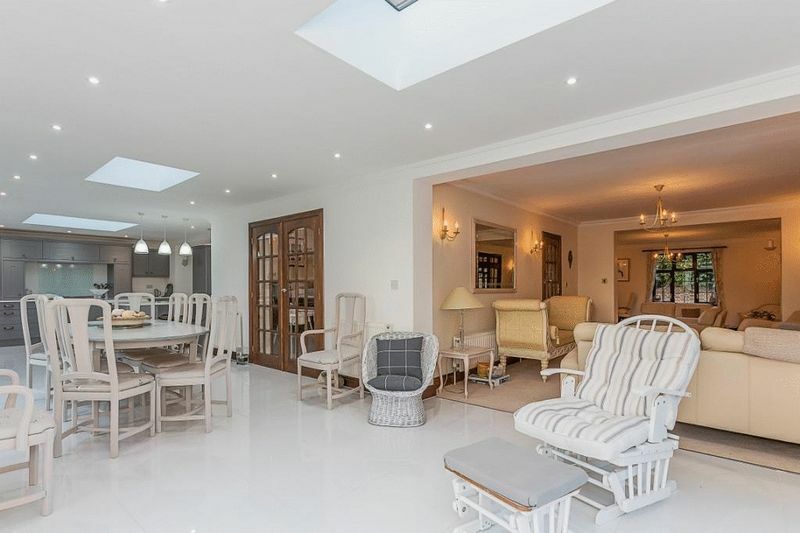 Meadowbank comprises a large extended 4 bedroom period property set in approx 0.7 acres of walled mature landscaped gardens with a beautiful Duck pond at the front of the plot. 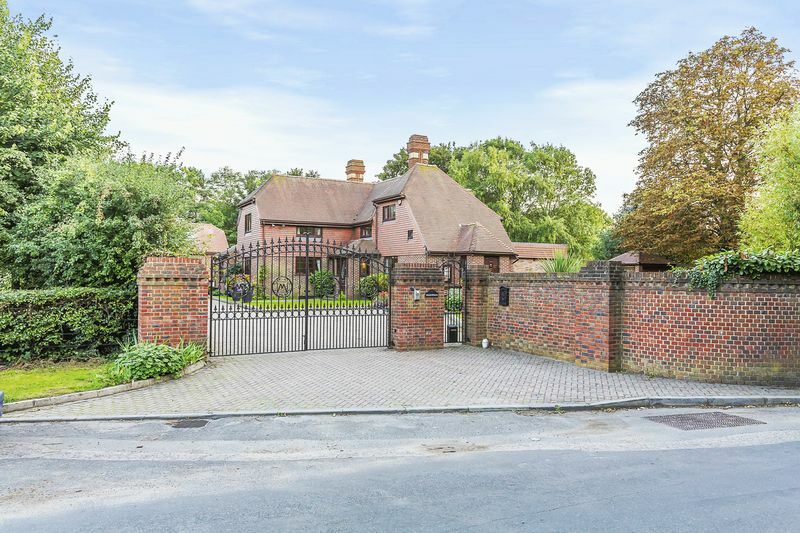 Accessed through double electrically controlled wrought Iron gates the house is prominently placed in the center of the plot, surrounded on all sides by Green Belt including the historic Avenue of Limes, Heritage Gardens with a private gate leading directly onto the green fields. 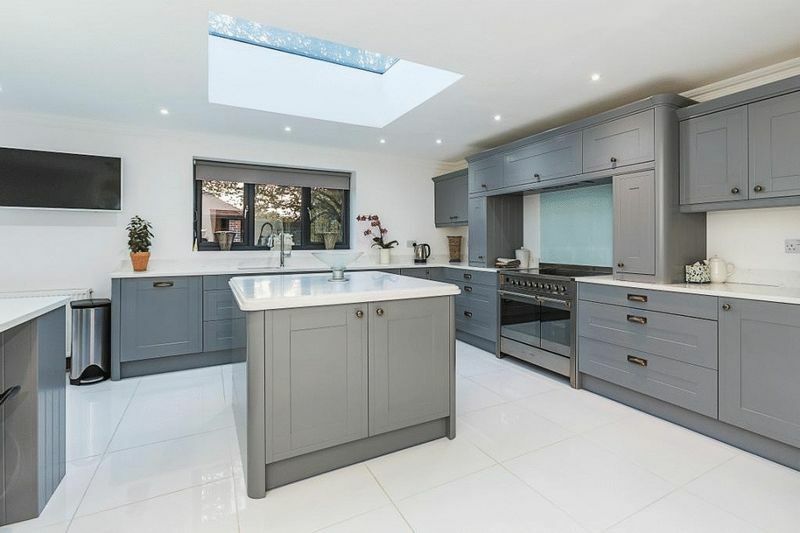 This impressive property is a credit to the current owners who have sympathetically restored and extended. 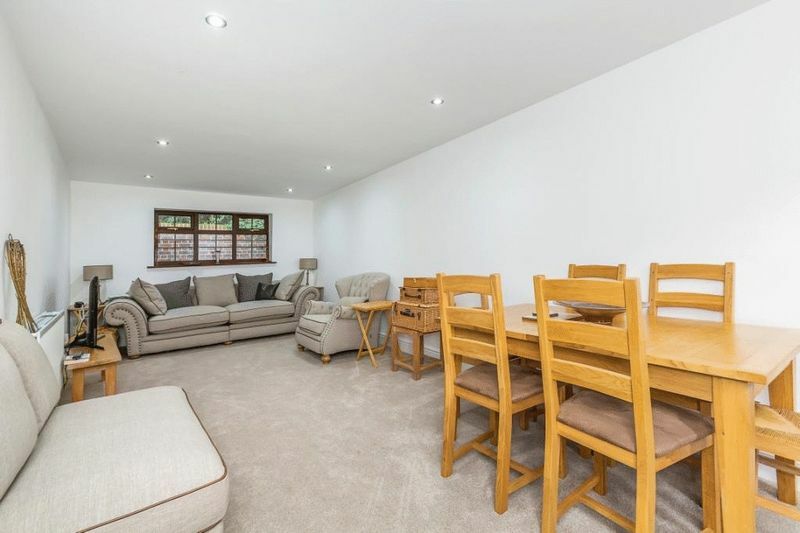 The property comprises a large hallway, leading to cloakroom and large extended open plan kitchen and dining room with separate utility room. 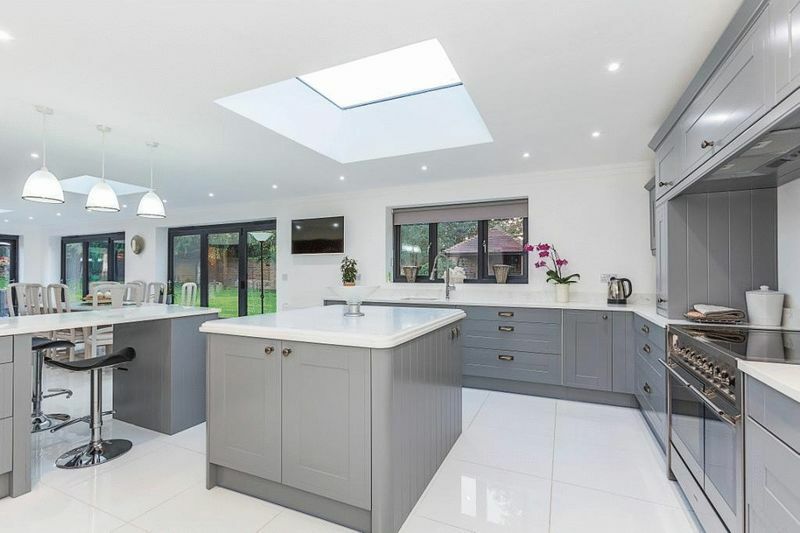 The kitchen is spectacular and has large bi fold doors over-looking the mature gardens, large patio and summerhouse. 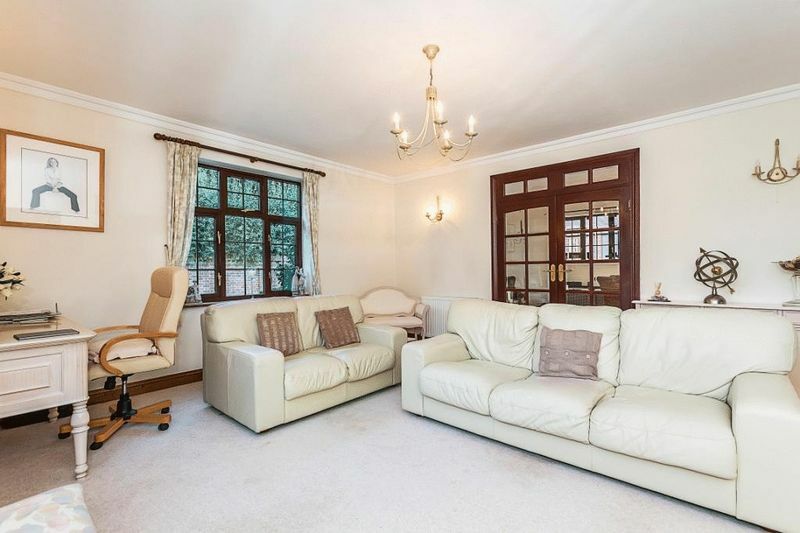 The ground floor also has 2 large reception rooms, garden room and a separate office/study. 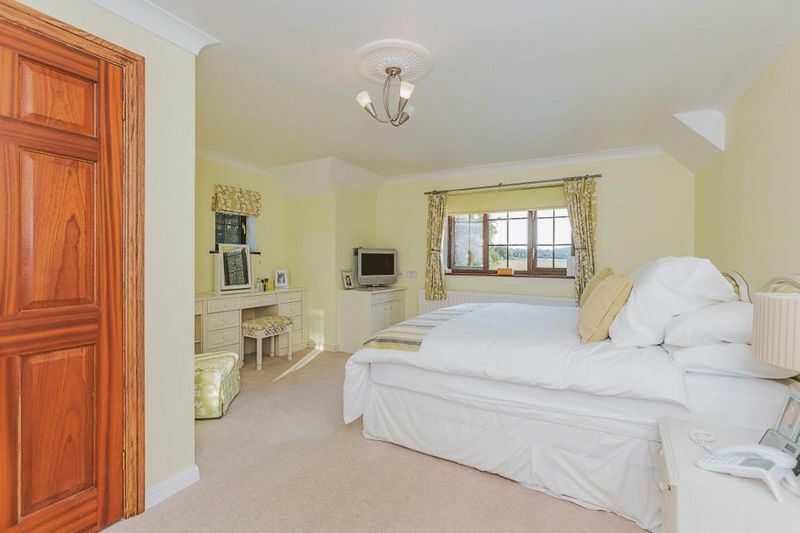 The first floor comprises 4 double bedrooms (master and bedroom 2 with en-suites) and a large family bathroom. 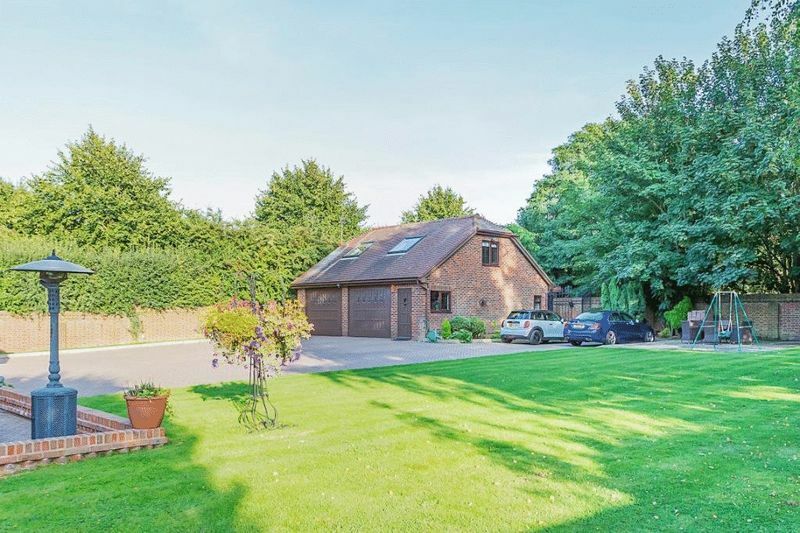 Externally at the top south facing part of the plot is a large detached 2 storey garage and annex comprising a large garage with electrically controlled doors and a garage that can accommodate 2-3 cars. 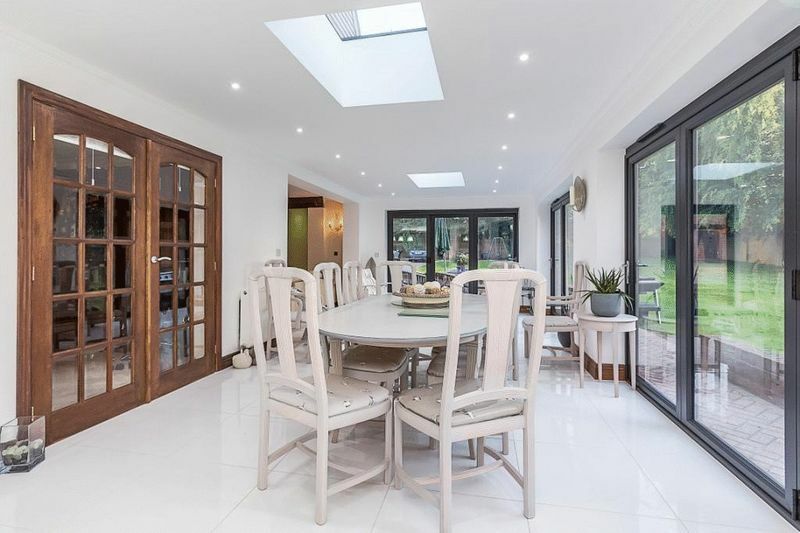 A separate door leads to a well specified designer kitchen and lounge with patio doors to a small courtyard. 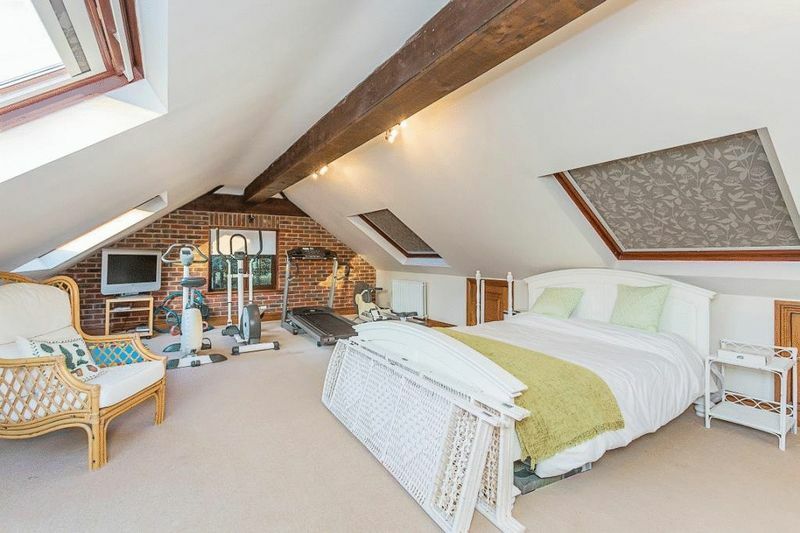 the first floor has an attractive large room currently used as a gym with 4 skylights and ample storage. This rare to market stunning property can be viewed by appointment only through Sole Agents Harpers & Co on 0322 524425. Hardwood door with leaded light insert, side windows, herringbone brickwork. 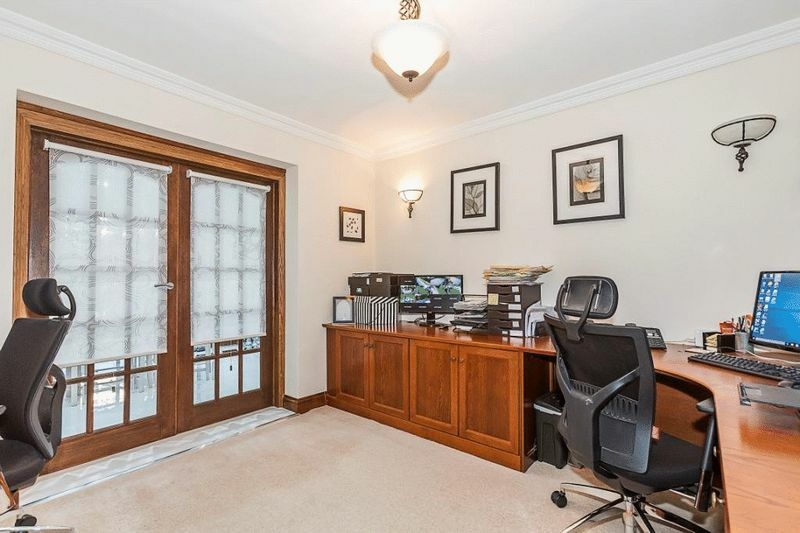 Hardwood door, porcelain tiles throughout, skirting, ornate coving, spotlights to ceiling, 2 x radiators with TRV valves, light to ceiling, PIR alarm, window to drive. 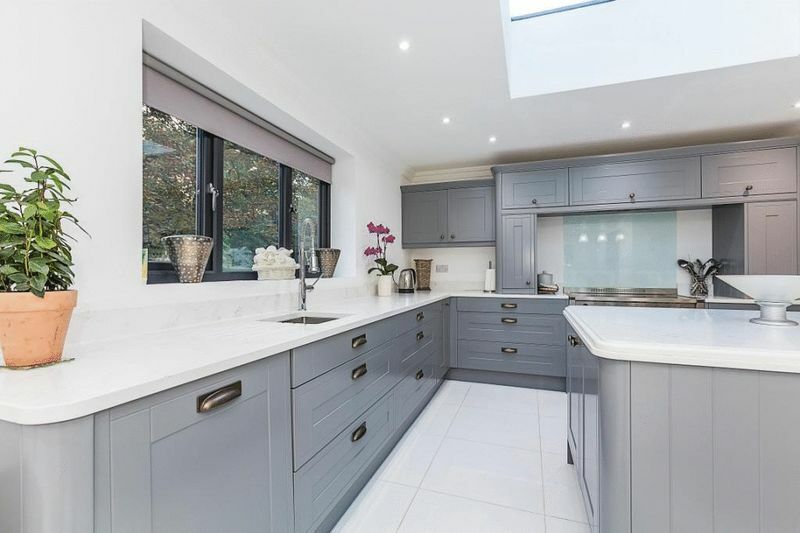 White porcelain tiles, skirting, coving, LED spotlights to ceiling, integrated white vanity unit with chrome mixer taps, designer W/C with push-rod waste, 1 x hardwood frosted glass window, chrome heated towel rail. White porcelain tiles throughout, Wren designer kitchen, grey wall & floor mounted kitchen units with white/grey marble worktops, 5 ring induction hob with integrated designer hood, large kitchen island, breakfast bar, stainless steel sink with separate chrome mixer taps with detachable shower style handle, inbuilt Bosch dishwasher, LED lights to ceiling, skirting, coving, 1 x large skylight. 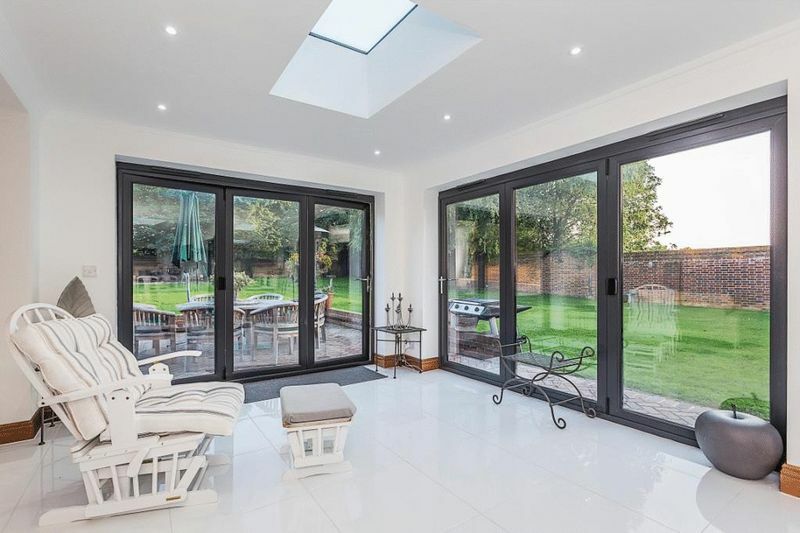 White porcelain tiles throughout, grey bi-old doors with garden views, roller blinds, 3 x skylights to ceiling, multiple plug points. 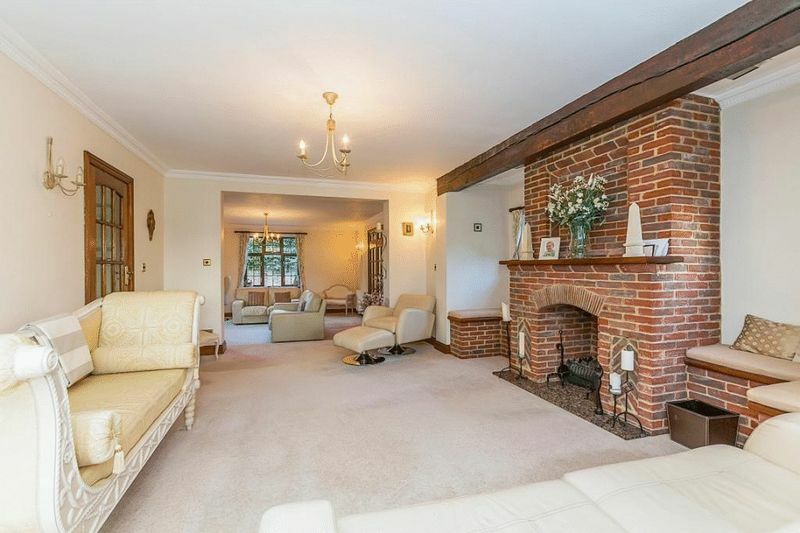 Fully carpeted throughout, skirting, coving, ornate herringbone brick fireplace with original Oak beam to ceiling, 2 x small windows, pendant lights to ceiling, PIR alarm, multiple plug points. 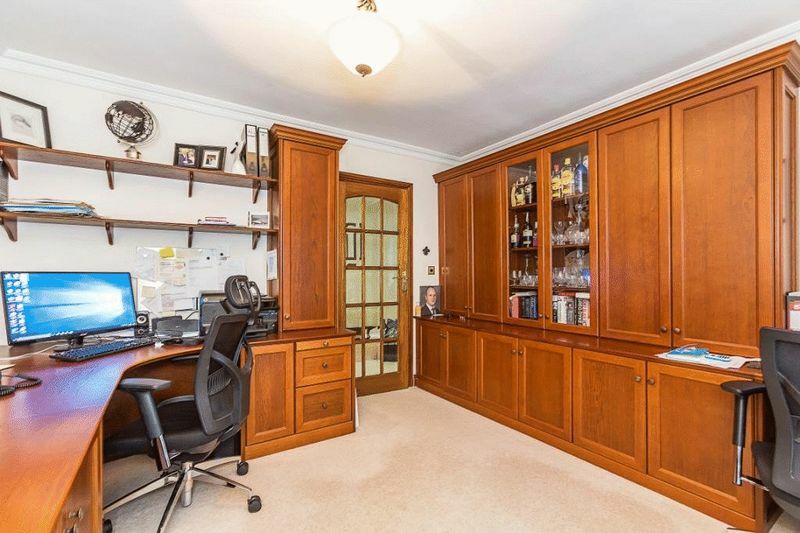 Fully carpeted throughout, skirting, coving, multiple plug points throughout, hand built bespoke oak wraparound desk with shelving & cabinets throughout, pendant light to ceiling, wall mounted lights. 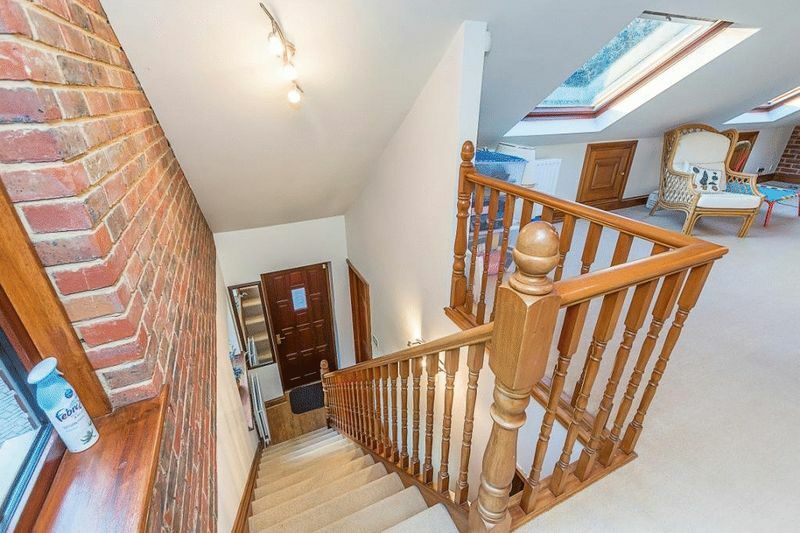 Access to hallway and dining room and kitchen. 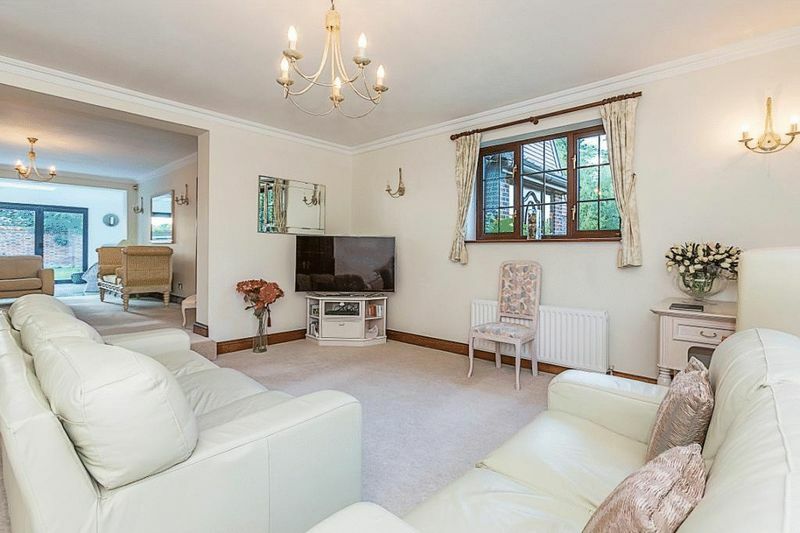 Fully carpeted throughout, skirting, coving, 2 x radiators with TRV valves, 2 x windows with garden views, leads into second reception. 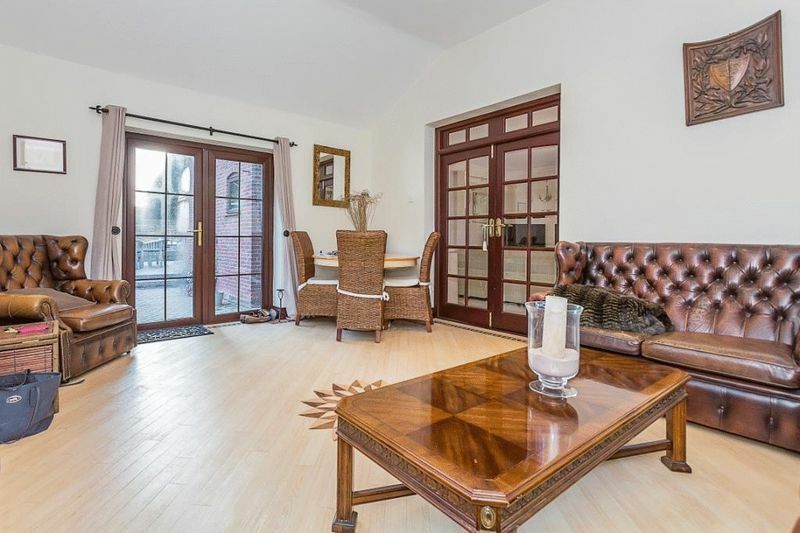 Amtico flooring throughout, with ornate border & central feature, spotlights to ceiling, skirting coving, 2 x windows with side & rera garden views, 1 x radiator with TRV valve, ornate hardwood cover, French doors leading to patio area. 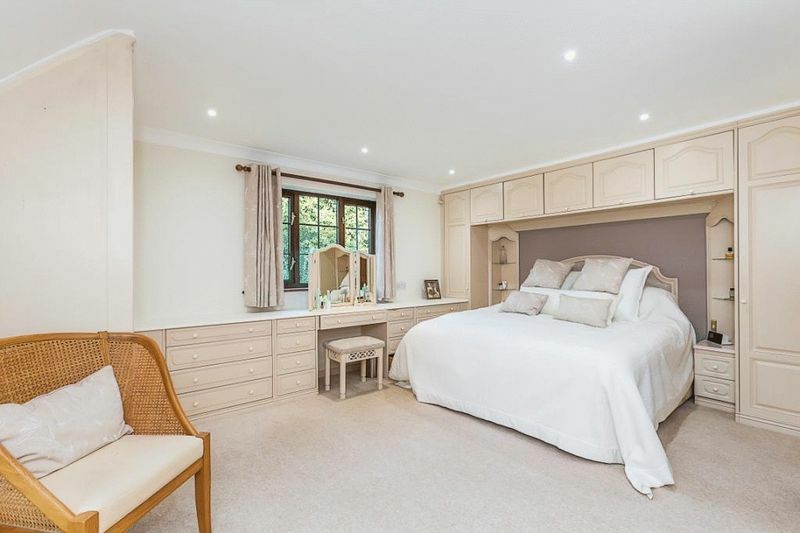 Fully carpeted throughout, skirting, coving, multiple plug points, integrated wardrobes, shelving & dressing table, 2 x windows with front & side garden views. 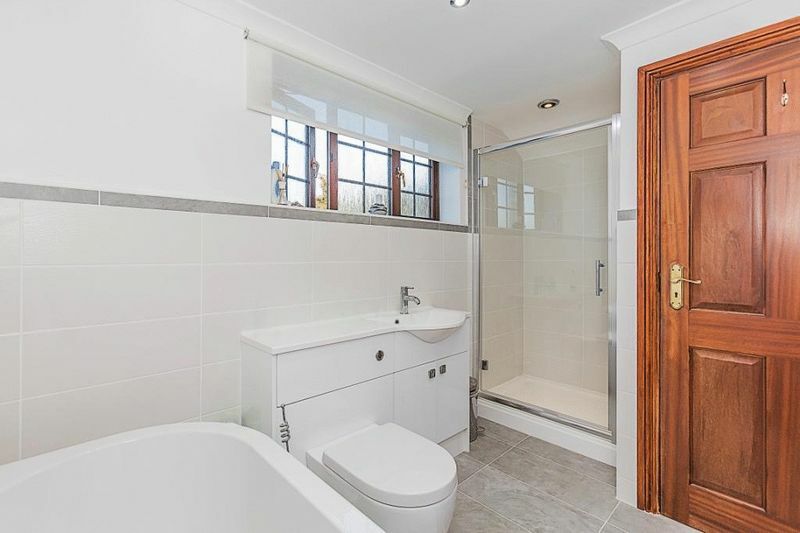 Door leading to en-suite. 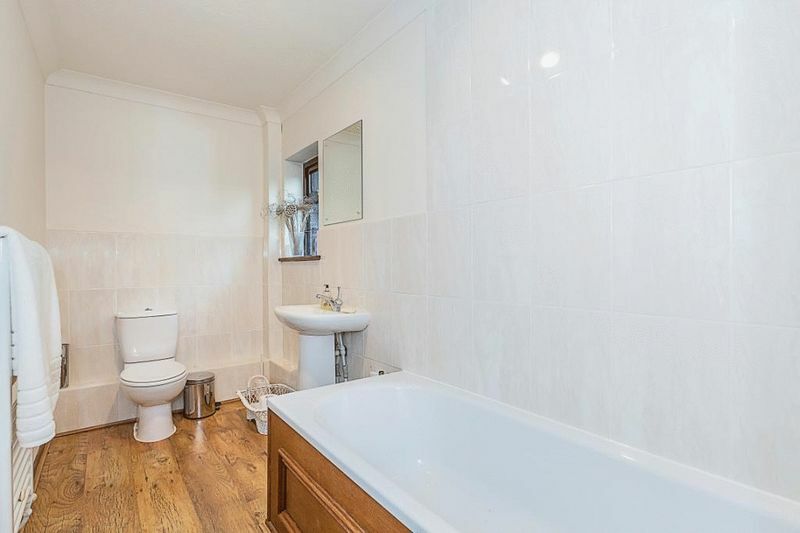 Fully tiled throughout with attractive border, spotlights to ceiling, electric shaving point, vanity unit with basin & chrome mixer taps, 1 x small window with side views, chrome heated towel rail, glass shower cubicle. 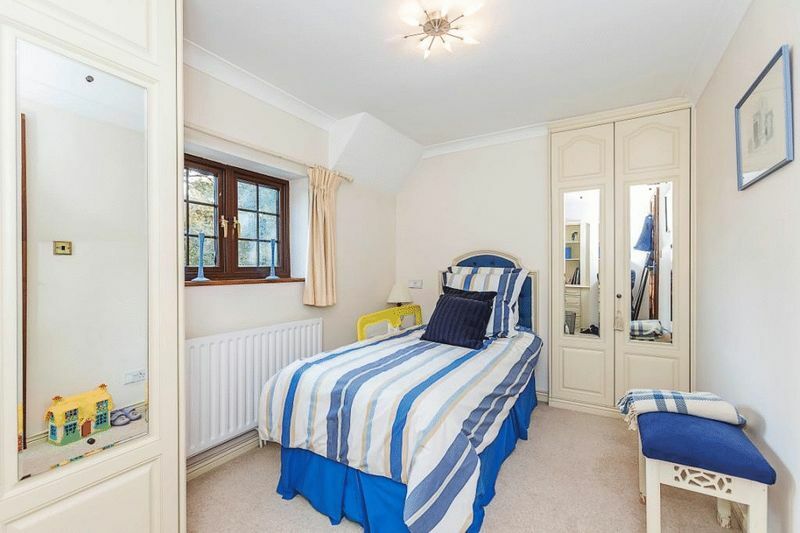 Fully carpeted throughout, skirting coving, multiple plug points, radiator with TRV, 2 x windows with garden views, inbuilt dressing table & storage cupboards, door leading to en suite. 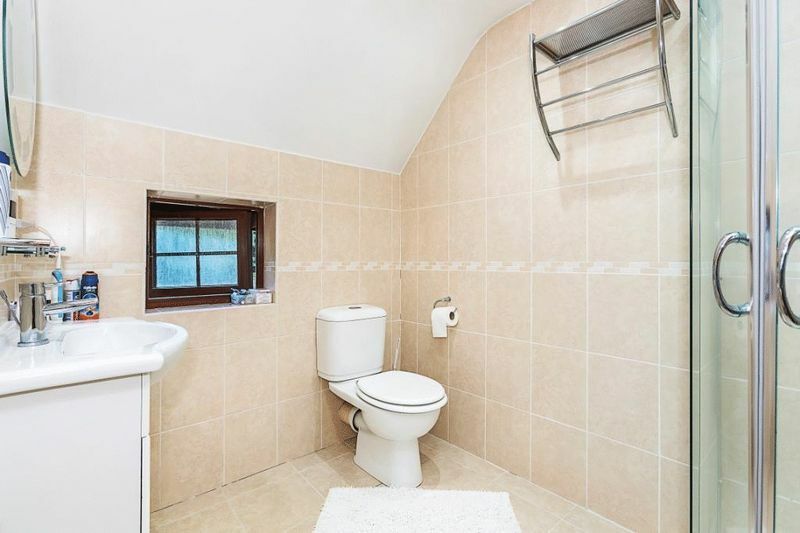 Tiled flooring throughout, corner shower cubicle, spotlights to ceiling, chrome mixer taps to wall mounted basin, w/c with push-rod waste, 1 x window with rear view, extractor fan with integrated spotlights. 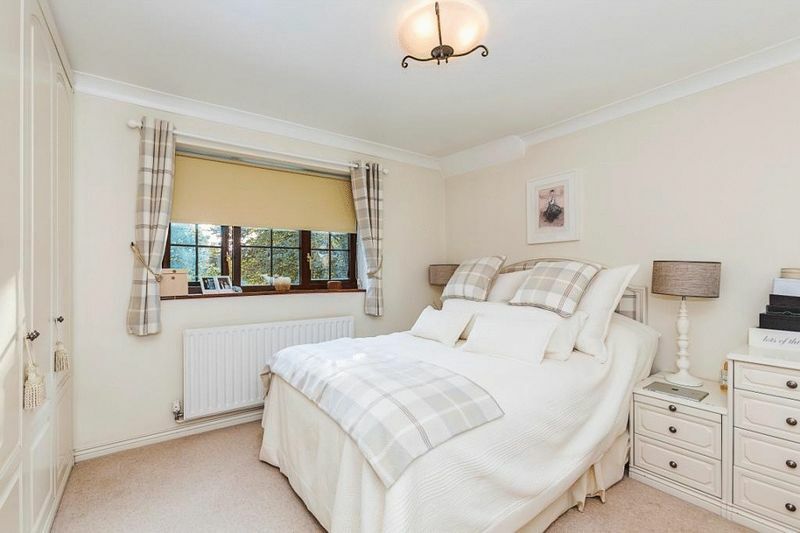 Fully carpeted throughout, skirting, coving, 1 x rad with TRV, 1 large window with Venetian blinds and rear garden views, integrated wardrobes & drawers, pendant light to ceiling. 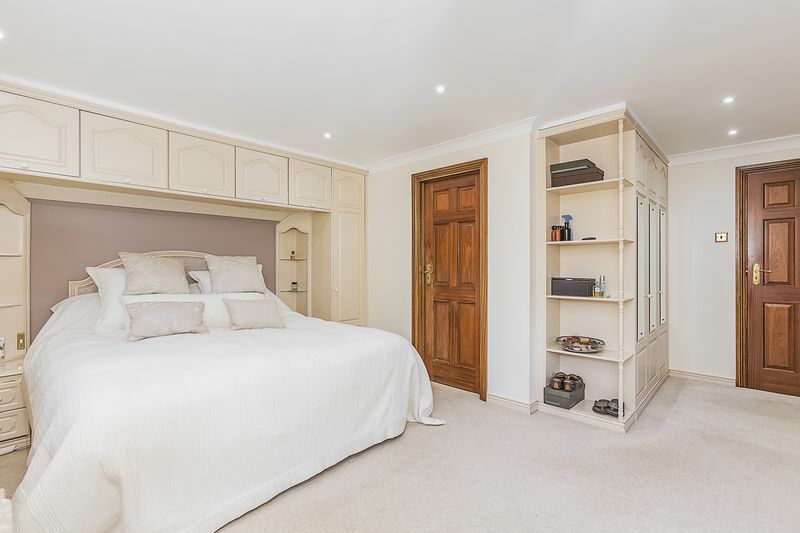 Coving, skirting, Fully carpeted throughout, multiple plug points, pendant light to ceiling, leaded light insert window with side garden views, integrated storage cup bookcase & drawers inbuilt bespoke wardrobes. Eaves currently house water units which has potential to be converted into another en suite (see floorplan). 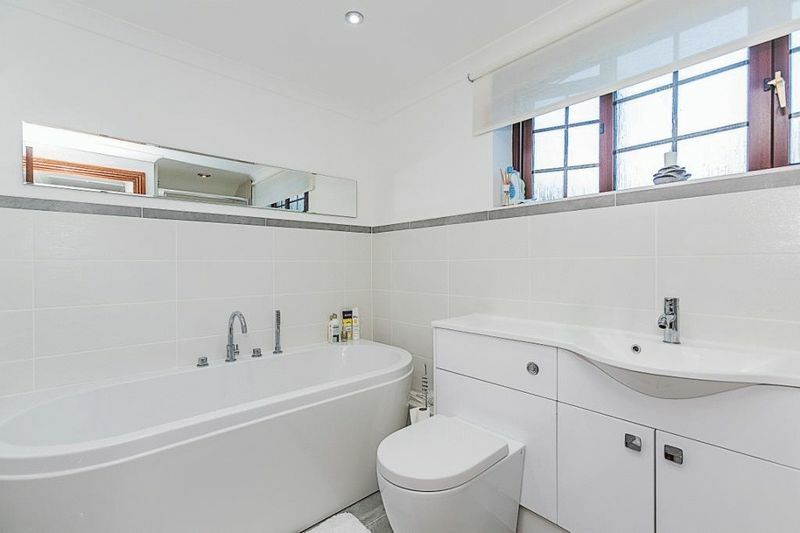 Fully tiled throughout, glass shower enclosure, , inbuilt white vanity unit, chrome mixer taps, designer W/C with push-rod waste, oval designer bath with chrome mixer taps, chrome heated towel rail, LED spotlights to ceiling, ceiling mounted extractor with LED spotlight. 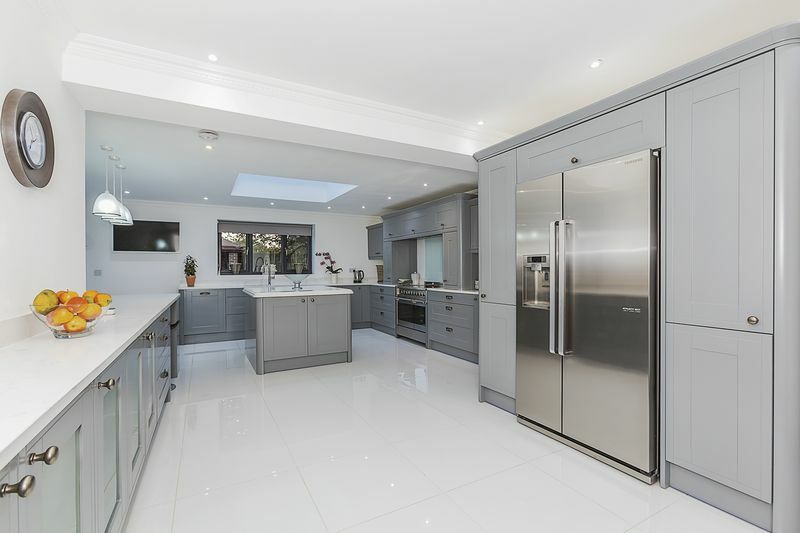 Fully tiled throughout, skirting, coving, LED spotlights to ceiling, white porcelain basin with right-hand drainer & integrated waste disposal, chrome mixer taps, floor & wall mounted white gloss kitchen units, 1 x radiator with TRV valve, side door to separate porch. 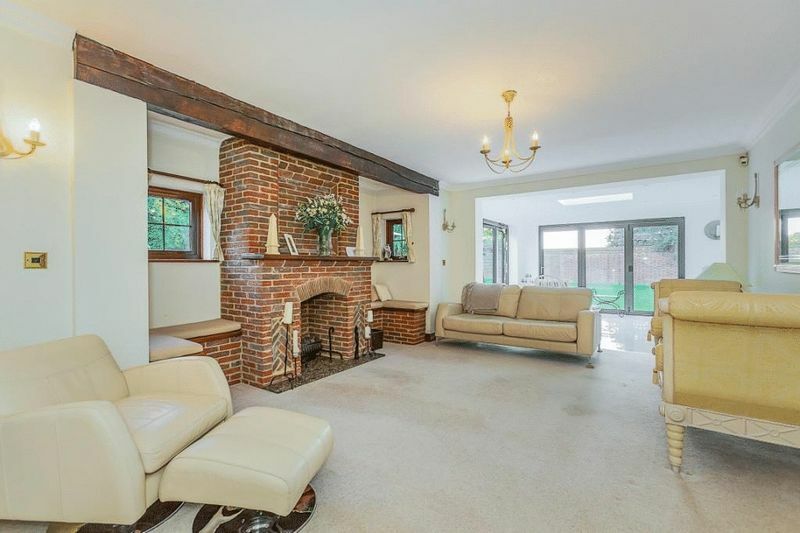 Double garage downstairs with up & over doors, front hardwood door, exposed brickwork, staircase leading to second floor with oak banisters, under eaves storage units, 3 x rads with TRV valves, multiple plug points, attractive reception room with a large oak beam, 4 skylights with integrated blinds. 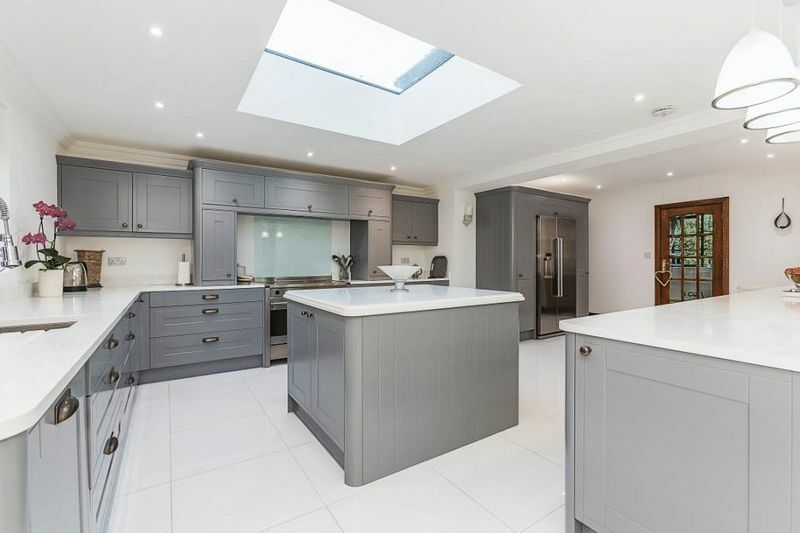 Ceramic tiles throughout, white gloss floor & wall base units, with 4 ring electric hob, stainless steel extractor, double oven, white tiled splash-back multiple plug points, spotlights to ceiling. 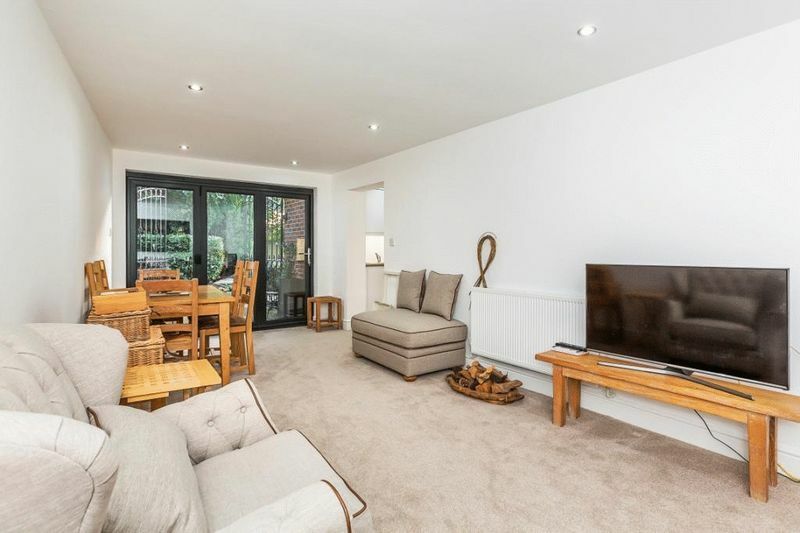 Fully carpeted throughout, skirting, spotlights to ceiling, 1 x rad with TRV valve, grey bi-fold doors leading to a small concrete courtyard with wrought iron gates and electric roller shutters. 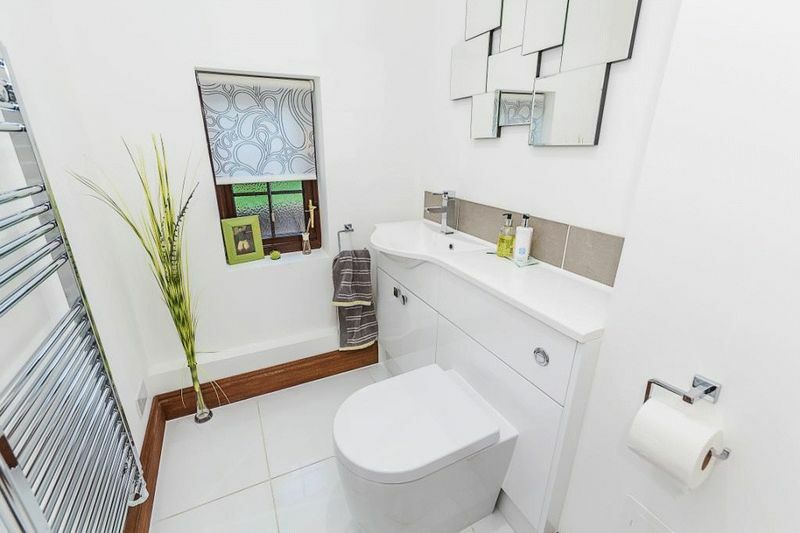 Amtico oak effect flooring, panelled bath with chrome mixer taps and shower attachment, white porcelain basin with chrome mixer, white WC with push-rod waste, 1 x frosted glass window, spotlights to ceiling. 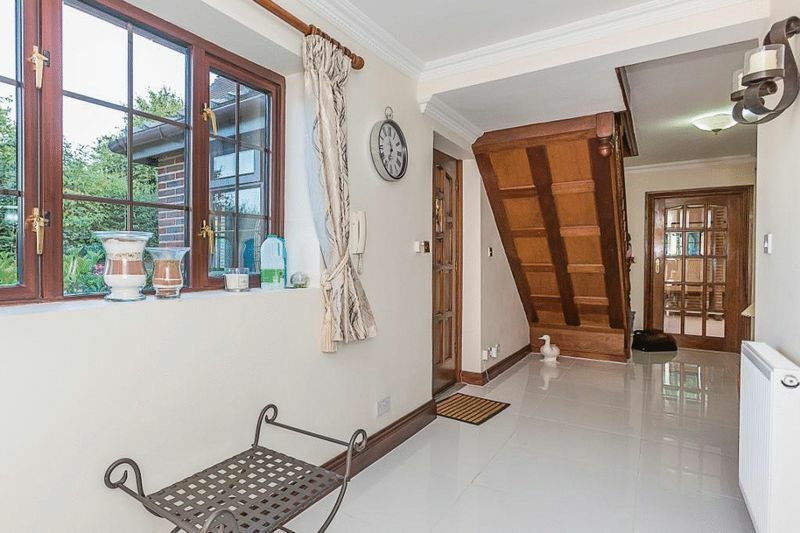 Oak staircase to landing, fully carpeted throughout, 2 x rads with TRV, multiple plug points, 4 large skylights with integrated blinds. Eaves storage space. 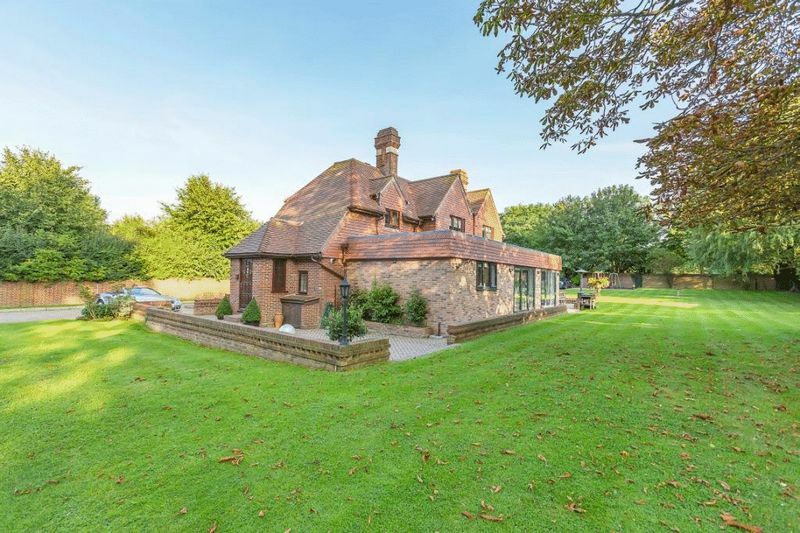 Manicured and matured walled garden with mature trees and shrubs and planting beds. A large duck pond and raised bed to the front electric wrought iron gates. 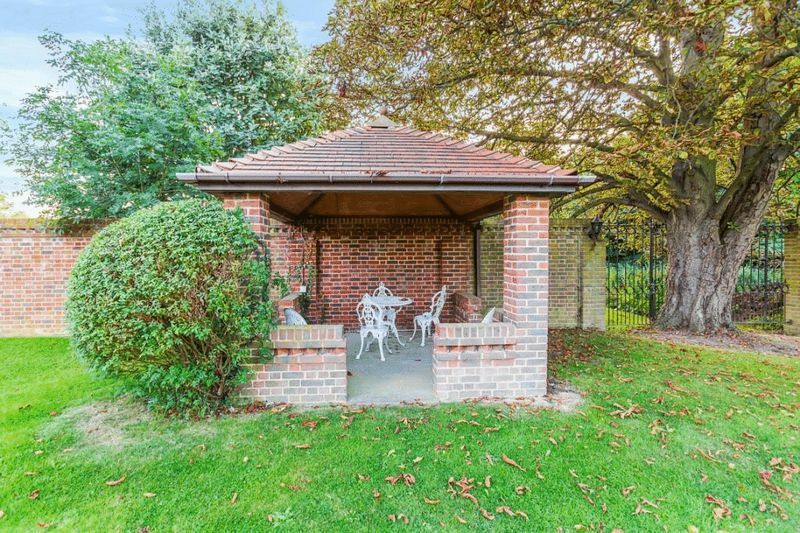 Brick paved driveway throughout and large patio area (south facing). House and grounds protected by multi-camera CCTV. 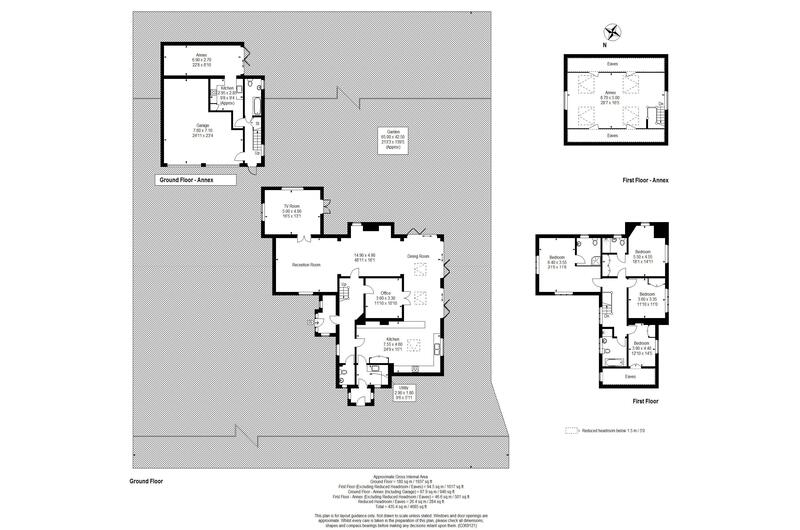 Harper's & Co are delighted to offer one of the most prestigious properties to come to market. 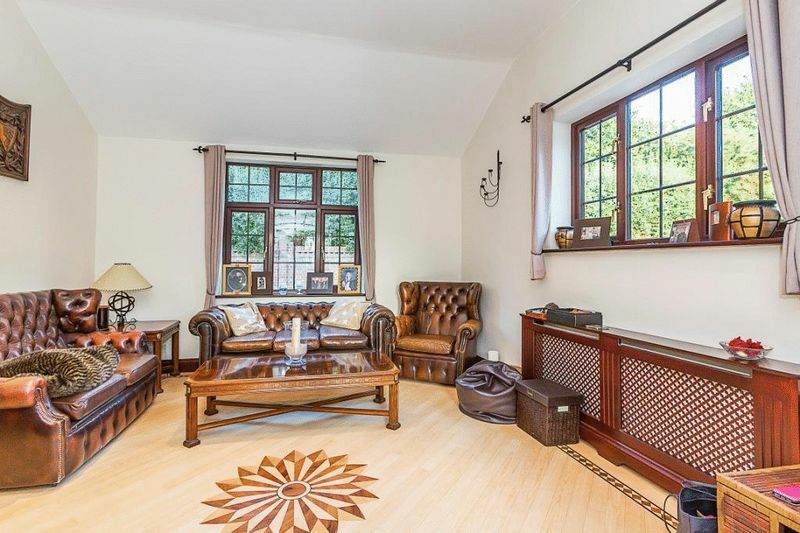 This immaculate and impressive property is a credit to the current owners who have enhanced the character of this prominent property and have made excellent use of the large private and walled grounds. 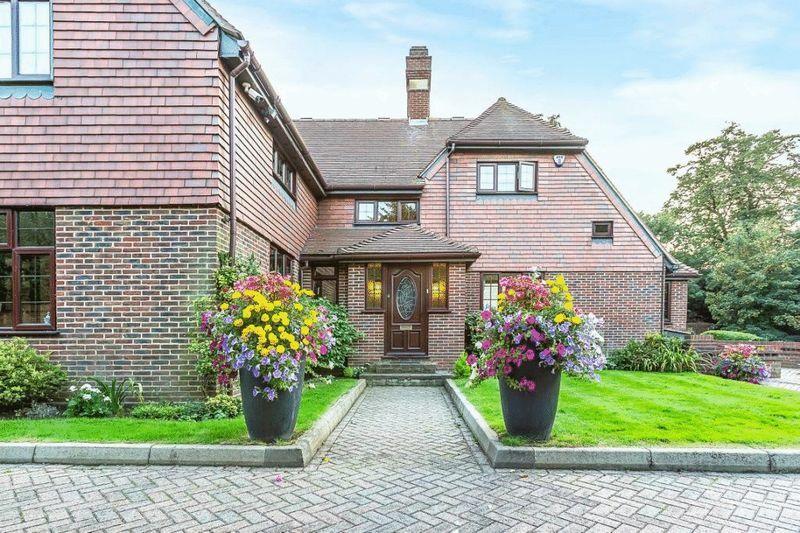 Applicants wanting a unique and prestigious property are urged to view by appointment only through Sole Agents Harper's & Co on 01322 524425.